No rig too big! We can take them all. Ideal location to old Tucson, Sonoran Desert Museum, casinos, shopping and golfing. Pets welcome. Pull thrus, heated pool & spa. Check for affordable rates. ---BEWARE--- Prince of Tucson should be renamed to "Joker of Tucson". We picked this RV park because it was along I-10 and had pull-thru spaces. DO NOT BE FOOLED - the pull-thru spaces are so close together, that there is less that NINE INCHES between RV's (see photo). There was NO WiFi in the park for nightly guests. The long-term renters had their own WiFi system. When asked about no WiFi, the office lady said it's been broken for awhile and to sit in the office to use. The RV park is geared for long-term mobile homes and old RV's, not nightly RV guests. The yearly renters allow their dogs to poop everywhere. We watched as dogs roamed around the park and pooped at will. We would rather park at a Walmart in downtown Detroit than this park again! This is an older park with not much going for it. Feel completely mislead by the Good Sam ratings. Sites are tiny - our Class B barely fits and neighbors next to us are just a couple of feet away. Going out our front door and 2 feet away is our neighbor's sewer hose. Pool is empty and closed on a 102 degree day in Tucson. Not enough room for a table outside or to extend our awning. Office staff was extremely unfriendly. No hello or greeting, no thanks for staying. Just a "what can I do for you?" greeting and then never looked us in the eye the entire check-in process. We couldn't get out of there fast enough. We booked a two night stay but left after one. Restrooms are clean and park was pretty quiet, considering that it is right next to the freeway. This is a very well kept RV park. We stayed one night on our way across country in May. The staff was friendly, bathrooms were well kept. The campground is next to the major freeway but the sound walls kept most of the noise out. We would stay there again. We brought our 35 foot Fifth wheel to town to visit our college aged kids over thanksgiving break. This is a nice location for that purpose. The park is clean. The staff is very professional and friendly. Bathrooms are clean. Pebble rocks get into the RV quickly, we took off our shoes before entering the rv to avoid that. The only drawback, and my only reason for not giving 5 stars is not within management control and also part of the reason we chose the place...the freeway is right next door. There is freeway and railroad noise, which was expected when I booked. Otherwise, a very peaceful park. Occasionally you'll get the scent of car exhaust waft through from the freeway. However, the nearby freeway does have a positive, in that this park is easy to get in and out of right from the freeway. It is highly likely we will return to this park for future visits to Tucson. We stayed here for 5 weeks last winter and will definitely return when we're in Tucson. The office staff were great, the site was great and the proximity to everything we wanted to do was great. However, there is no cable and over the air was problematic because there was some type of interference in the evening. If you went to the office area wifi was okay, but there are times I don't want to cart all my stuff somewhere else to use wifi. We've encountered this in numerous parks and feel like they need to realize we're in the 21st Century and people really rely on their electronics to balance checking and savings accounts and to pay bills. Repeaters could be installed at a relatively low expense and need to be installed. Other than this I would highly recommend it. Wifi and cable were the difference between 4 and 5 stars for me. 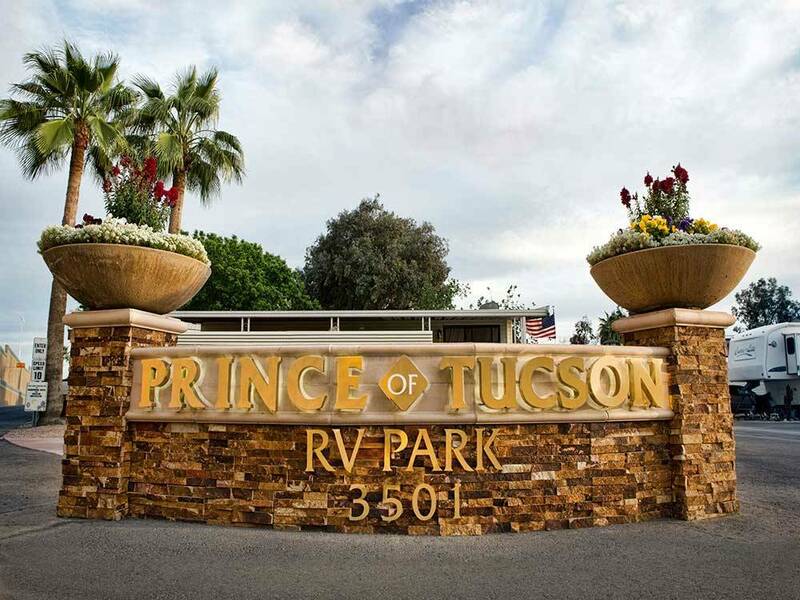 We stayed at Prince of Tucson RV Park and enjoyed our stay. Our site was gravel with a large concrete patio. The pool and spa were very nice. There is a lot to see and do in the area and the park is centrally located and easy access to I-10. Overall, it was pretty appealing, people were friendly, tidy environment. Downsides were that the bathroom had no soap for the duration of our stay, and were not that nice to begin with, and you could smell the sewer due to it not having water. Older park right next to I-10 Freeway. Very little noise from traffic due to freeway high barrier wall. Very clean. All spaces are very tight and close to each other and are gravel. Very close to everything in downtown Tucson metro area. Pool and spa need updating. 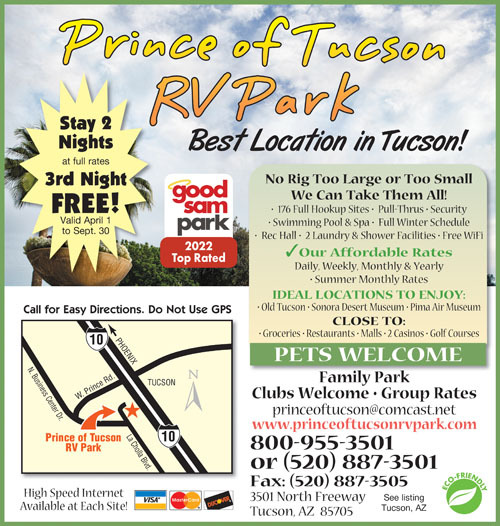 Pets are walked outside of RV park. Arrived late and still had an easy check in. Site was a little confusing but it was a slow week and it didn't matter. Pool was outstanding. Bathrooms a little od but clean and well maintained. Would stay there again. For a park of this caliber, the restrooms need to be remodeled. Poor flow from shower heads including surging. I expect to feel safe while taking a shower. Using shower curtains on a rod to separate shower "stalls" is not a secure privacy situation. The restrooms were not clean. The situation for packing RVs into the pull through spaces is obviously to tight as most of the water risers are bent over. Also, no picnic tables as there is no room. If you are traveling with dogs, there is only gravel and pavement. It would have nice if there was some area set aside in the park with dirt for dogs, as it is you have to walk outside the park fence for their "dog walk" . Glad you had a great visit, hope to see you next time you visit Tucson! The spaces where so small, we were squeezed in next to a class A and a fifth wheel that were vacant. You cannot even open your awning or you will hit the rig next to you. There are only two restroom/shower facilities in the entire park, and one is located in the main office. The restrooms are filthy, the showers are filled with globs of hair and shower drainage is inadequate. They are clogged and do not drain so you end up standing in ankle deep water. The water pressure is ridiculous. There is a sign in the toilet stalls stating to double flush your stool. Disgusting. There are absolutely no community events bringing RV'ers together. No free wi-fi or basic cable. No continental breakfast. We rarely saw anyone in the park, although there were a lot of r v's. The park is mainly for people living in there r v's. On a positive note, the laundry facility was clean and reasonably priced. The park was quiet. We are sorry to hear you had problems with your stay! We pride ourselves on having a clean facility, restrooms, laundry and public areas including our pool! Our water pressure is set to a consistent 65 psi, to all sites. You must have stayed in a pull thru site, the only sites that do not have awning availability is our 12 pull thru's. Many of our back-ins can accommodate 44 foot units with 4 slides! You are correct we do not offer cable, and TengoInternet only allows for 2 days free service. September is what we call our "Off-Season", come back in November and we will have our activities in full swing! Next time if you have any problems, please feel free to come to the office and we do our best at making your stay in enjoyable one!